Chic, edgy and high fashion, this pin-straight styling of the soft blunt cut showcases sharp angles and lines while highlighting the model’s facial features. 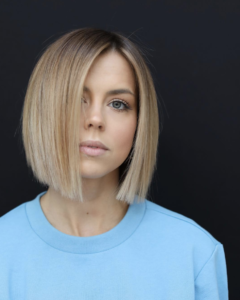 Cut at a slight A-Line, the model’s hair is first prepped with L’Oreal Professional 10-in-1 for sleekness and protection prior to being flat ironed. Anh then used a point-cutting technique to soften the blunt edge. Small pops of bright blonde are strategically placed from the roots in front of the face to draw attention to the model’s face, and the look is lastly finished off with L’Oreal’s Mythic Oil for maximum shine.